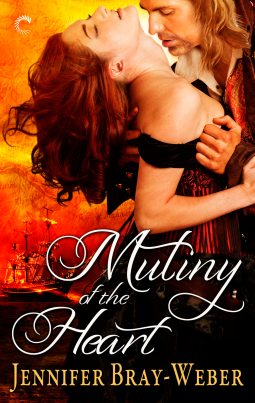 This suspenseful romance brings us to the Caribbean waters full of pirates, battles and lusty encounters. Where other novels would have a helpless woman aboard a ship as a passenger, the twist offered with Mutiny of the Heart is the fact that the very capable captain of the Rissa is a very capable female who also has a sexual relationship with a crew member. Joelle is the strong-willed female who has earned herself honors along the privateers due to her skill and charm but she has one mission in life: to find the answers hidden in the map her father left behind. The waters get muddy when she hires a handsome map reader to help her and wild abandon threatens to take over..mutiny style. While the love triangle is the major thrust (pun intended) there is a subplot of intrigue and mystery that speeds us along as the characters are enjoyable and well defined. Erotically told but not quite over the top, the novel offers themes of independence, willpower and choosing love over pride. The writing style succeeded in keeping my interest, where some may blush at the detailed sexual encounters it seems to fit together perfectly to form the perfect beach read.